The Jewish clockmaker and mechanician Jewna Jakobson (or Jacobson) lived in the second half of 18th century in the town of Nieswiez (a significant part of the population of Nieswiez was Jewish at that time, over 700 people) on the territory of former Lithuania, then Poland, then Russia, and now in Belarus. Unfortunately, almost nothing is known about the life of Jacobson, and besides this machine, the only historical artifact from him, was a golden chalice, kept some time ago in a church in Gnezno village, near Poznan, Poland, which had an inscription, that it has been made by Jewna Jakobson in 1786. Jakobson apparently was a clockmaker and mechanician (and probably a jeweller) in the court of Polish magnates Radziwill in the town of Nieswiez (Radziwill, who owned the town from 1533, granted the Jews certain rights, which made the town a good place for them). Radziwill valued culture, arts and science, and are known from fostering inventors and masters and collected a significant amount of artifacts and an extraordinary library. During 1740s-1780s these masters created a lot of valuable masterpieces, and obviously one of them was Jewna Jacobson. 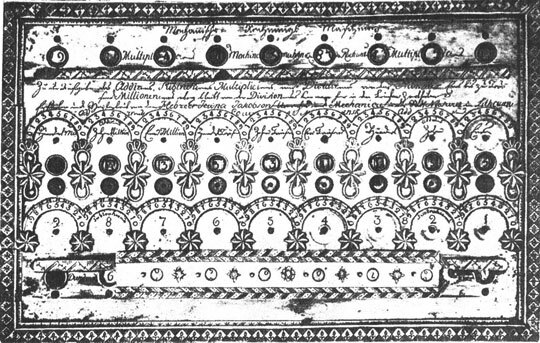 A calculating machine, created by Jacobson before 1793 (most probably even before 1770), is now kept in the collection of Lomonosov Museum of Science in St. Petersburg, Russia. 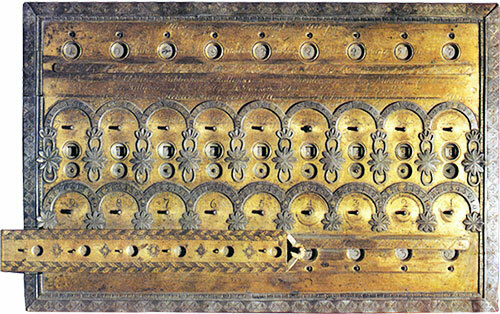 The device is convenient and reliable for use and is has been used for a long time, which can be seen by deep traces of driving keys on the lid of the only preserved copy. 1. Mechanische Rechnungs Maschine; Machina Mechaniszna do Rachunku—mechanical calculating machine (in german and polish). 2. Zu der Aufgabe des Addirens, Subtantirens, Multiplicirens, und Devidirens von den Nummer Eins bis zu Tausend Millionen und ubrig bleibt von der Division und das kann man hier in der Bruchen zertheilen—for the purpose of adding, subtraction, multiplication and division from 1 to 1000 millions, the remainder of the division here can be divided to fractions. 3. Erfunden und verfertigen von dem Hebreer Jewna Jakobson, Uhrmacher und Mechanicis in der Stadt Nieswiez in Lithauen, Gouvernement Minsk—invented and manufactured by the Hebrew Jewna Jakobson, watchmaker and mechanician in the town of Nieswiez in Lithuania, government Minsk. 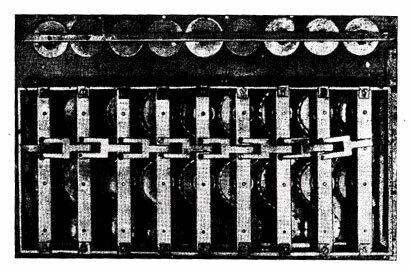 Like almost all mechanical calculating devices from the XVII, XVIII and XIX centuries, the machine was intended for adding and subtracting. The performance of multiplication and division can be done by means of consecutive adding and subtracting or by using the multiplication table, which is engraved on the lid. The machine is executed as a compact brass casket with dimensions: 34.2 cm long, 21.8 cm wide and 3.4 cm high. It has four chiseled legs, 1 cm high and 1,6 cm in diameter each. The inventor placed placed pinion groups of neighboring tens on different levels and thus very efficiently utilized the case's volume. The design of the machine is based on pinion wheels, similar to the wheels of Schickard's machine, but Jacobson undoubtedly has not been acquainted with it. There is also an original element—namely a semi-disk, which performs the functions of both input device and the first step in the train of gears. In the upper part of the machine are mounted 9 digital dials, while in the lower part are mounted 6 digital dials (bellow a moving lid), which are used for entering of the numbers for calculation and for storing of intermediate results. Over and bellow the upper row of 9 disks are placed 2 other rows of semi-disks, which are engaging with the digital disks and are used for entering of the digits during adding and subtraction. The numbers are entered by rotating of the axes-levers (whose edges are with square section) of the 2 rows of semi-disks by means of a special key. The scale around upper disks consists of digits from 0 to 9, inscribed in clockwise direction, while the scale around lower disks consists of digits, inscribed in counterclockwise direction. The result of operations can be seen in the small round windows, which can be seen between the two scales. On adding operation first must be rotated the axes of the upper row of semi-disks clockwise until the arrow of each semi-disk come to point to the proper digit of the arc-scale. Then the keys are loosed and a special spring returns the semi-disks in starting position, and in the result windows can be seen first addend. Then in the same manner must be entered the second addend, and the result can be seen in the result windows. The digital disks can be rotated in the starting (zero) position by means of another row of levers, which are bellow the result windows. On subtraction the minuend is entered in the upper row of semi-disks, and subtrahend is entered in the lower row of semi-disks by rotating counterclockwise. After each entering axes-levers are returned to the starting (zero) position, and the result can be seen in the result windows. The counting mechanism of each digit position has semi-disk with 9 teeth, whose axis can be rotated by means of the entering key. This semi-disk meshes with the pinion-wheel and rotates it as many teeth, as many steps is rotated the lever. Over the pinion wheel is fixed the digital disk, and its digits can be seen in the windows. The mechanism for tens carry is a long finger, which once during each revolution engages with the tooth of the next digital position and rotates it to 1/10 revolution.